EDMONTON – As part of a bid to expand its overall major appliance business, The Brick has opened three new commercial design centres under its Midnorthern Appliance banner. One is located here in its home town with the others in Ottawa and the Toronto suburb of Burlington, Ontario. This brings the total number of design centres to six. The others are located in North York – another Toronto suburb – as well as in Calgary and Coquitlam, a suburb of Vancouver. The latter was the first design centre to be opened when it was unveiled in late 2017. Midnorthern Appliance, which will celebrate its 60th anniversary in 2019, specialises in supplying high-end appliances to builder, architects, designers and other commercial customers. Each of the commercial design centres display vignettes featuring the latest premium appliances from manufacturers such as Bosch, LG, Thermador and G.E. The also offer speciality brands from around the world including Germany, Italy, New Zealand and Turkey. “We are excited to offer these premium products through our new commercial design centres, offering great selection and a great customer experience,” Dave Freeman, president of The Brick, said in a statement. The Brick, a wholly owned subsidiary of the publicly-held Leon’s Furniture Limited (LFL), acquired Midnorthern in 2002 and is believed to be one of the largest white goods retailers in the country with a market share in the 10% range. However, its share has probably grown substantially since the exit of Sears Canada, which was the country’s largest appliance retailer for most of the two decades prior to its demise. In its Retail Commodity Study, Statistics Canada pegged household appliance sales at $6.31 billion in 2017 – a gain of 22% over the prior year. Category sales for the first of 2018 were estimated at $3.2 billion, an advance of 8.1% year over year. 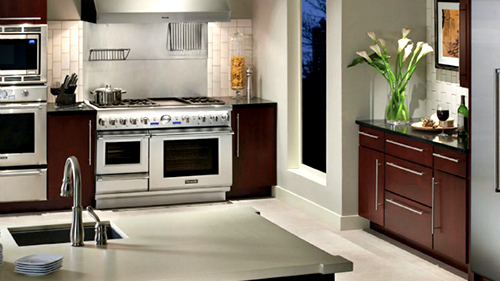 LFL’s other subsidiary – Leon’s Furniture – also operates an arms-length commercial appliance division. Appliance Canada operates solely in Ontario and recently opened a unit in London, bringing its network to five stores including one in Ottawa with the others in and around the Greater Toronto Area. In its announcement, The Brick noted its commercial design centre in-store showrooms boast creatively inspired displays beautifully appointed with home décor and a variety of high-end brands that enable customers, such as new home builders, designers, or residential property managers, to visualise the product selection in a more natural home-like setting. “Whether for a single-family home or a multi-unit residential building, customers will have available a range of appliance package options to fit any budget,” the company said. All three of the new locations were opened in November. In Edmonton, it can be found at 10705 – 101 Street; in Ottawa at 565 West Hunt Club Road; and, in Burlington at 990 Fraser Drive. Although a target number wasn’t given, the company said it intends to open more commercial design centres in 2019.